Roast game with this seasonal warm salad is the perfect dish for an autumn evening or wintry lunch. Season the partridges inside and out with salt and freshly ground black pepper. Heat half of the butter in a large ovenproof frying pan, when foaming, add the partridges. Fry them for 1-2 minutes on each side, until golden-brown all over, then transfer to the oven to roast for 12-15 minutes, basting with the pan juices halfway through cooking. The partridges are cooked when the juices run clear when a knife is inserted into the thickest part of the thigh meat and no trace of pink remains. Meanwhile, rinse the buckwheat under cold running water then drain. Add to a saucepan, pour over the chicken stock and bring to the boil, then reduce the heat until the mixture is simmering and simmer for 8-10 minutes, or until just tender. Drain well, discarding the chicken stock, and set aside. Blanch the leeks in a pan of boiling, salted water for 2-3 minutes, or until just tender, then drain and set aside. In a bowl, whisk the pomegranate molasses, honey and vinegar until well combined. Allow the cooked partridges to rest in the frying pan, and baste them with the pan juices occasionally as they rest. Heat the remaining butter in a large frying pan over a high heat until golden-brown. Add the buckwheat and fry until toasted and golden-brown. Remove the pan from the heat and stir in the pomegranate molasses dressing, the pomegranate seeds, the parsley and the cobnuts. Season, to taste, with salt and freshly ground black pepper. Just before serving, heat a griddle pan until hot, then add the blanched leeks, drizzle over the vegetable oil, and season well. Cook until brown chargrill marks appear all over the leeks. 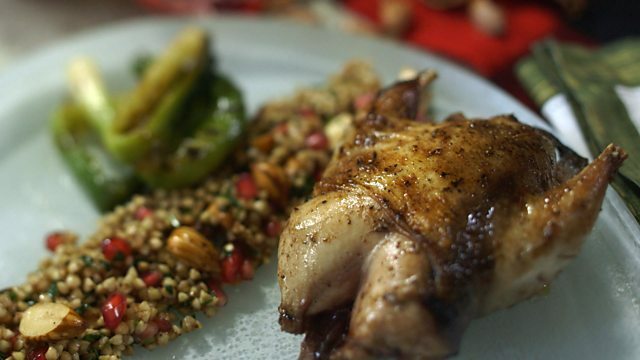 To serve, spoon the buckwheat salad onto serving plates, place one partridge alongside each portion, then top with a few leeks.